The Pro Sportfisher Hookguide is a key component of our Tube Flies, and the Caddis Fly Shop offers a full selection of these silicone Hook Guides in a wide variety of color finishes, with prompt shipping, no sales tax, and low cost or free shipping. The Pro Tube Tubefly System Hook Guide is a hook holder that is durable, flexible, removable, available in fish attracting colors or "strike points" that salmon and steelhead tube fly tyers and fishers rant about. What we especially like about these Pro Tube Tubefly System Hook Guides is that they are particularly well suited to use with a looped-on octopus style stinger hook that we use on our long, trailing hackle Steelhead and Salmon Intruder flies. 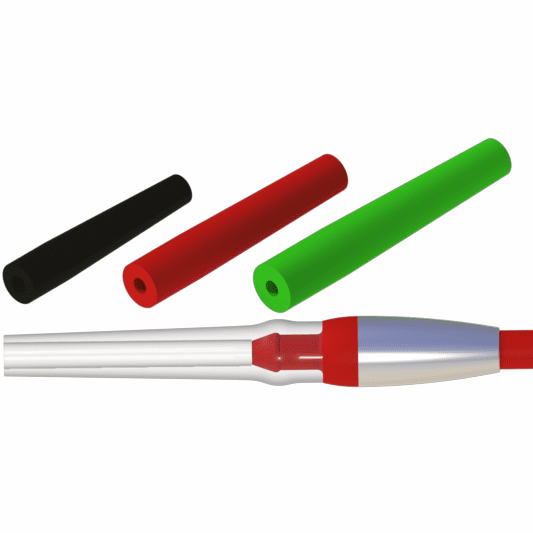 The flexible opening on of the Pro Tube Silicone Hook Guide is smaller than the opening of a Pro Tube Flexitube. Because the opening is both smaller and flexible, the Silicone Hook Guide will hold the knot (double surgeon�s or Uni-non-slip loop-knot).